Leicestershire will end the season without a win for the second year in a row after losing their final Division Two match to Derbyshire by 408 runs. Leicestershire collapsed to 112 all out in their second innings after Ben Slater and India batsman Cheteshwar Pujara struck centuries for the hosts. They declared on 372-3 to set the visitors an improbable 521 to win. Leicestershire are the first county side to go two seasons without a Championship win since World War Two. On the day the Foxes announced the signing of Australian paceman Clint McKay as their overseas player for next season, they ended the 2014 campaign with another demoralising defeat, their 10th in 16 Championship matches. When was Leicestershire's last win? Derbyshire resumed on the third morning with a lead of 310 runs and they added a further 210 before declaring shortly after lunch. Captain Wayne Madsen (69) could only add three to his overnight score but Slater, who began day three on 73 not out, celebrated his new contract with the county by registering his second century of the match. 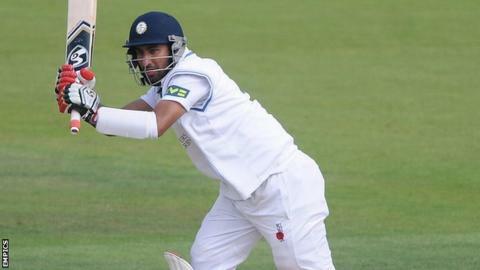 Slater and Pujara put on 124 for the third wicket, and when he fell for a career-best 119, Pujara (100 not out) raced to his first hundred for Derbyshire from 115 balls. Leicestershire's chase got off to the worst possible start as Mark Footitt bowled Greg Smith for a duck with the third ball of the innings, and they were 44-5 by the end of the 10th over. Footitt eventually finished with 5-34, taking his tally of Championship wickets for the season to 82, making him comfortably the most successful bowler in Division Two. "The commitment, the energy and passion that we've played with over the last few months has shone all the way through to the end. "Often seasons can taper off when there's nothing to play for in terms of trophies but I'm extremely proud of the players because the application we've shown has been exceptional." "We couldn't have asked for any more from the bowlers and the attitude and energy we showed in the field was very good. "But we weren't anywhere near our best with the bat, which is a shame because all season we've had batsmen who have performed. "When you get distractions off the field, they do make a difference to how you perform on the field. I don't think we've played with clear minds for the last month or so."